Halloween is a night dedicated to silly costumes and getting out of the everyday norm. Regardless of whether you are a parent of human children or fur children, Halloween is a non-traditional way for families to come together and create long-lasting memories. Take a moment and check out some of Equipaws’ favorite pet Halloween costumes. We hope these can inspire you and we look forward to seeing your beloved pets all dressed up in the perfect outfit for them. Be sure to check out our blog post on dog Halloween safety for costume do’s and don’ts before trying these out, though, and our tips for safely walking dogs on Halloween too! We cannot get enough of this Willy Wonka and its Oompa Loompa! Themed Halloween pet costumes add to the excitement and allow for unforgettable memories and countless selfies. Whether you re-create your very own group of Oompa Loompas or the Wicked Witch and her Flying Monkey, we encourage the entire family to get dressed up this Halloween. Check out Costume-works.com to see these and more creative ideas for pets and owners! Now on to Fancy Pants Halloween Pet Costumes! If you have a very tolerant pet we encourage you to get a little bold and go all out! These extravagant costumes are beyond adorable whether they stand alone or are a part of a coordinated costume. Brit + Co posted a wide array of unique costume ideas that will get your creative juices flowing. We can all agree that a huge reason we like to dress up our pets with these silly Halloween costumes is for the laughs. Dogs tend to be better sports with dress up, a cat in costume’s face is sublime. 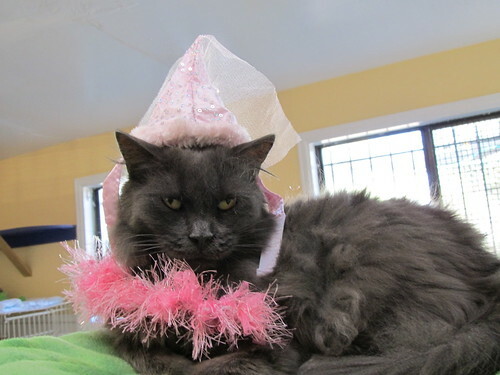 Just check out Princess Gidget from Rocky Mountain Feline rescue- her expression is hilarious. As always, make sure you have your kitty’s consent when putting on costumes. They’re definitely not for every feline, but check out these fun Halloween cat costumes! Whether your favorite was the powerful female role of Wonder Woman or the goofy youthful performance of Spiderman, it is hard to deny the significance superheros have played this past year! Keep the spirit alive by dressing up your pets as your favorite hero! Also, be sure not to leave out any exotic critters. Bunnies, guinea pigs, and even lizards can make some of the best superheros! Take a look at these small critter costumes, and check out this awesome Thor cosplay made by GrumpyDess for her adorable guinea pig. We’re dying from the cuteness!